Where we went: Chiang Rai is Thailand’s northernmost city and is surrounded by mountains. Various hill tribe people live in the area around Chiang Rai. July 28, the present king’s birthday, is a national holiday, so we went on a three-day weekend and then took an extra day. 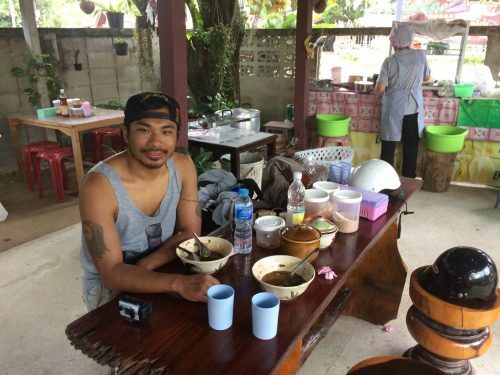 Why we went: I spent 3 days in Chiang Rai with a friend in 2014 and really enjoyed it, but Worchihan hadn’t been and wanted to go for the mountains, as they remind him of home. How we got there: We flew to Chiang Rai on Air Asia; the flight was one hour and 15 minutes. Where we stayed: We stayed at Bura Resort, which is about 9 miles (15 km) and a 30-minute drive from the center of Chiang Rai. 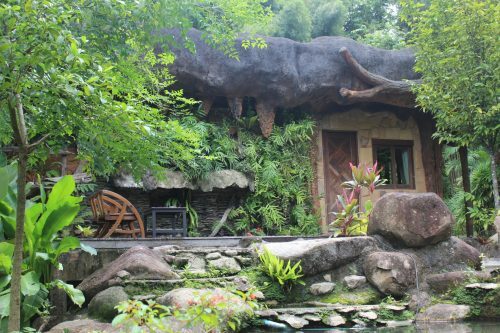 I found Bura Resort on Agoda and immediately thought of the Flintstones because of the stone exterior of the villas. 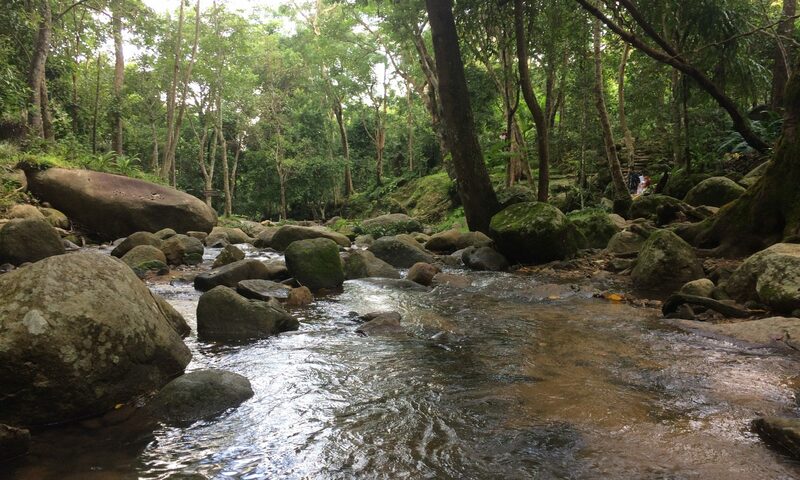 We choose Bura because of how beautiful it looked in the pictures, how far outside the city it was and how highly it was rated and we were not disappointed. I had high expectations, but Bura was even better than I imagined it would be. Pictures can’t capture the beauty of the resort. We were also impressed by the service the staff provided. Bura Resort has only eight rooms so the staff are able to really take care of their guests. Hannah picked us up at the airport when we arrived and dropped us off when we left. On our way to the hotel, she took us to a noodle shop to try a local dish and when Worchihan told her he wanted to get me a banana smoothie, she brought one to our room. 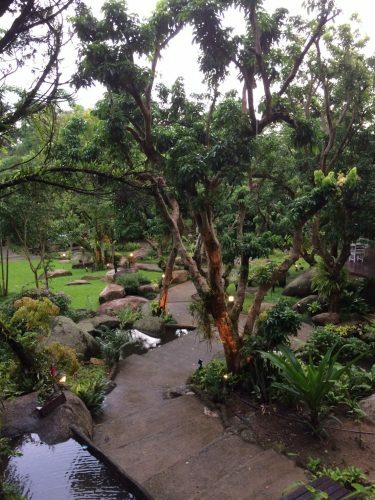 We would highly recommend Bura Resort if you’re traveling to Chiang Rai. What we did: We didn’t do a whole lot. 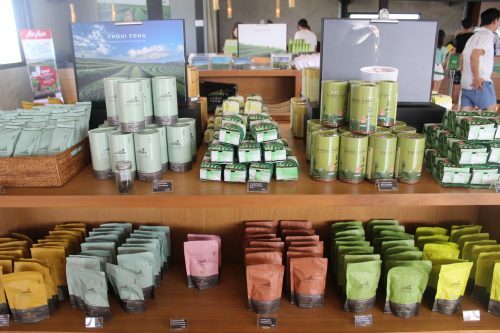 On Hannah’s recommendation, we went to Baan Dam and Choi Fong Tea Plantation. 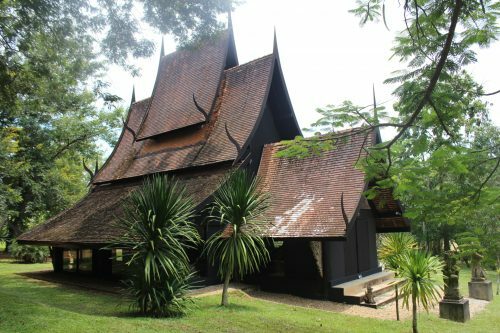 Baan Dam (Black House): This is a group of almost 40 buildings built by Thawan Duchanee, a Thai artist from Chiang Rai province and so many of the buildings exhibit northern Thai architecture. Baan Dam also houses the artist’s personal collection of animal skins, buffalo skulls, shells, art, etc. I thought it was a creepy place, but Worchihan enjoyed it. Baan Dam is about 20 minutes from Bura Resort and tickets are 80 baht ($2.35). 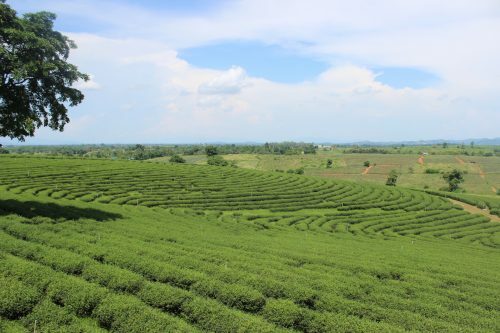 Choui Fong Tea Plantation: Worchihan and I had never been to a tea plantation, we both love tea and we wanted to go for a long ride on the bike, so the tea plantation it was! 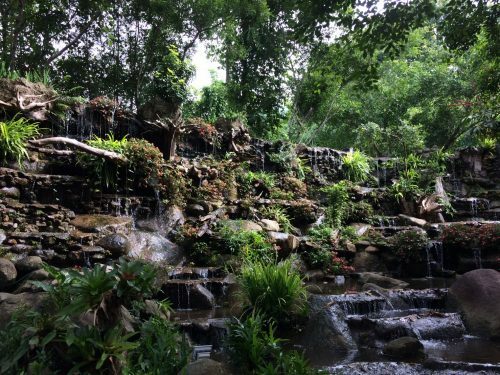 We had a delicious and reasonably priced lunch of spicy spaghetti, spring rolls and steamed pork dumplings when we arrived and then spent some time on a bench outside overlooking the plantation. We drove to another vantage point and took some pictures before leaving. Hannah also told us there was a waterfall less than five minutes from our hotel and we went, but we didn’t hike up to the top. We instead sat at the bottom with our feet in the water. There were quite a few teenagers and college students there when we went; what a beautiful place to hang out! 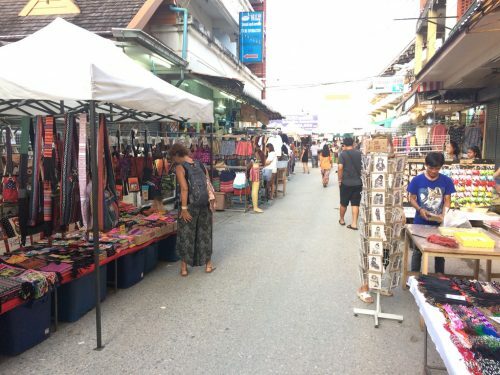 We of course also went to the night bazaar (market) and on Saturday night, the walking street, where streets are closed to make room for a large market. Where and what we ate: We like to eat cheaply when we travel, so we ate at the night bazaar, at the walking street and at a couple of local noodle shops. At the noodle shop in the picture below, we talked to the owner who came back to Chiang Rai after working in Bangkok for several years to help his mom open the shop, where a bowl of nam ngiao, noodles in a sour and spicy tomato-based broth, was only 25 baht (74 cents). 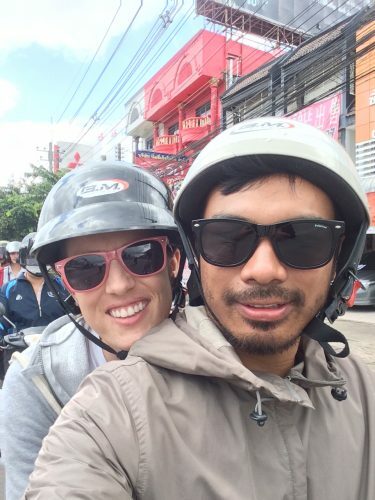 How we got around: After Hannah picked us up from the airport, she took us to a motorbike rental shop in the city where we rented a motorbike for 200 baht ($5.88) per day. You definitely need transportation when visiting Chiang Rai as all of the places to visit are at least 15 minutes outside the city. Renting a motorbike may not be the best idea because many of the places worth visiting are in the mountains. Another option is hiring a car with a driver for 2,000 baht ($59) per day during low season and 2,500 baht ($74) per day during high season (November-March); with this option, you can go wherever you want to go. The best part of our trip: Worchihan and I both most enjoyed riding around the area surrounding Chiang Rai on the motorbike. 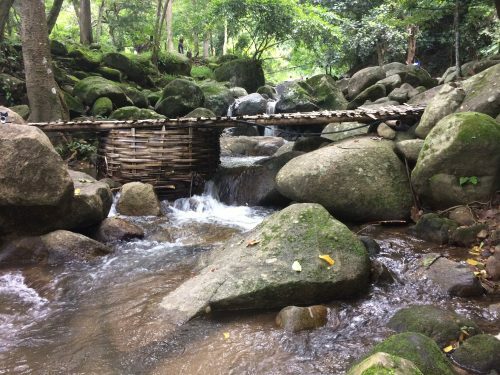 What to do next time: Doi Chaang Coffee Farm which is in the Ahka village of Doi Chang, and Doi Tung, which includes Mae Fah Luang Garden, a garden developed by the present king’s paternal grandmother (I have been to this garden and I loved it, so I really want Worchihan to see it). We will have to hire a car and a driver next time to visit these places as they are both in the mountains.